Ah Jeebus wept, an edit function'd be nice. Passing mod delete double, pretty please? Also, if Dredd had kept his helmet on he'd of looked bloody daft sat in the prison Shuttle. I 'spose they could have done a nice 'block his face with bits of the scenery' parody. Also, it isn't Rebellion's job to promote the movie. (Purely conjecture on my part) it appears that no one is allowed to do or say much to do with the film without the say so of the higher ups - Lionsgate in particular are infamously hawk-like and litigious in regards to the promotion and rights of their properties. They are obviously going for a concentrated marketing blitz closer to release - and they probably don't have the budget for a sustained, 18 month campaign in any case. Again going back to District 9 - a film with similar budget and ambition as Dredd - I consider myself pretty on the ball when it comes to films, but D9 wasn't even on my radar until I started picking up on the good early reviews it was getting just before it came out. I remember seeing a teaser for District 9 quite some time before it came out. They were getting word on the film out to the public in a small way at least for a few months with viral marketing. 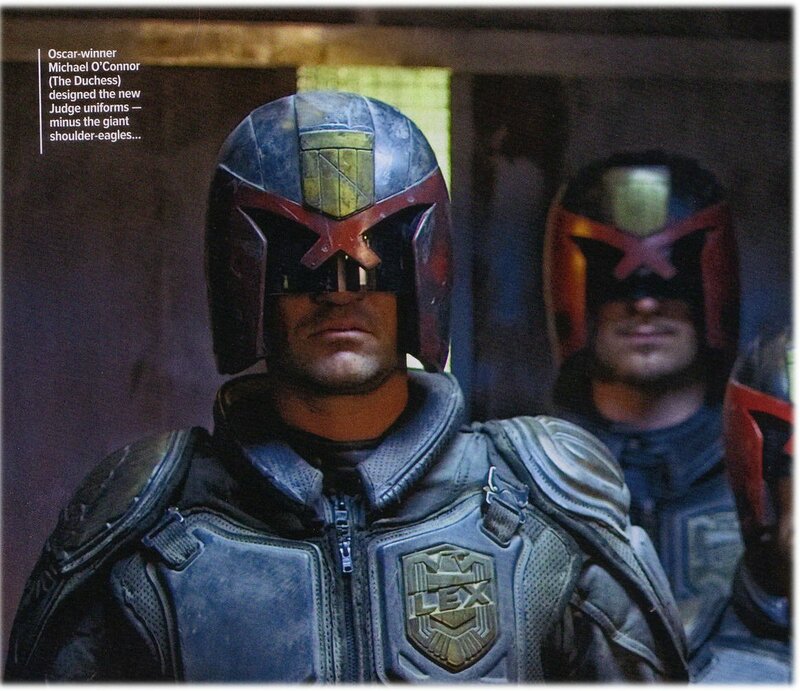 I think quality of script/story are far more important than Dredd's helmet. If the film is quality, I mean really quality...is something as superficial as the nose cross-piece going to ruin "the whole gamut of fiction and storytelling"? If so, don't waste your time or money. Not quite. Dredd without helmet is not Dredd. When Sylvester removed Dredd's helmet we were no longer watching Dredd but also Rambo, Rocky, Demolition Man and a lot of other action movies. The film was made into a pastiche of action movies. Sly used Dredd to sell his merchandise not the other way around. The same thing is happening with Sherlock Holmes. The audience can just about cope with it being set in the 21st century rather than the late 19th, but remove elements from the story such as Dr Watson and the audience starts questioning the storytelling. Sherlock could probably survive as a narrative without the Dr Watson character better than the Dredd narrative could survive without the famous helmet. Going by this Dredd's uniform should look good. Dredd without helmet is not Dredd. I've never bought this argument. A good Dredd film is not 100% dependent on him not showing his face. I'm pleased as a fan that the makers of Dredd 2012 have decided to keep the helmet on for the duration, but I'm also questioning whether this was a good idea cinematically, as the nearest examples I can think of - V in the godawful V for Vendetta adaptaion, and a few scenes in the first Spider-man movie where a masked Spidey is talking to a masked Green Goblin - were, imo, quite strange and unnatural to watch. Having a hugely famous movie star in the role and having him show his face for much of the duration - as was the case with the 1995 movie - is a different matter entirely, and yes, that harmed the film as a Dredd adaptation beyond repair, but I am not 100% against a movie Dredd showing his face - there are more important things than this - to me it's just a detail. It's far more important that they get the character and tone right. Yes radiator, the medium of film is completely different to the comic. A huge star like Urban is going to raise Dredd's profile and if this means deviating from the comic version Dredd in order to reach a wider audience, it's all for the good and I'm willing to swallow it. It's just that Stallone's Dredd tried this and went too far. Karl Urban isn't a 'huge star'. I don't think I've ever met anyone who knows who he is by name. Even prompting people with "You know, he was McCoy in the new Star Trek film..." is met with blank stares. If he took his helmet off momentarily and it wasn't a big deal and he kept it on for most of the film, I'd be happy. The fact that he won't be taking it off is brilliant. "I don't know if I posted this already but I talked to someone last year who'd seen a rough cut and they said DREDD was "extremely violent" and looked fairly concerned. Next thing I heard was that Travis was off the picture." "My concern - and this is simply going from the worried expression of this person, who works at a high level for the production company - is that they've pulled back majorly on the violence, and that this might be why Travis was locked out. They're looking at an expensive product and I'd be surprised if they'll settle for more than a 15 here in the UK. £30 million is a huge budget for a British film. And you can believe me or not but this was one of the main bods at DNA and I'm telling you: they were worried! People on this forum (Bluray.com) tend to forget: these films can't make a profit on the geek crowd alone. They need to break out to the wider public. I'm afraid when it comes to comic-book movies that means kid-friendly." So have DNA 'overcooked it' and had to go back and do reshoots to tone down the violence? a '15' rated film in the UK is preferable to an 18. I mean, i really don't think we are going to see a PG13 Dredd film, seriously, but pulling it back to a 15 may be thier aim. Also, it isn't Rebellion's job to promote the movie. No, IM GLOBAL are but I feel they're waiting for all the heavy Summer promotion to die down before they reall give Dredd the push. So in the span of two posts you went from vehemently opposing my view to accepting it after Radiator agrees? I'm happy Dredd is keeping the helmet on. But if it were a brilliant film from top to bottom, well-written and well-acted...but Dredd takes his helmet off, I can ignore that and I'm happy. Seems you're on that wagon, too, now that someone else is on board. What rating was District 9? . . . my brain cells are on the wain since I hit my forties. I am still of the opinion that if Dredd takes his helmet off, it is no longer Dredd. I can't believe you guys are still talking about the helmet . This is to me huge news! Having read and loved the tone of the Peach Trees script I would have loved to see an uncut version in the cinema, looks like I may have to wait for the DVD. I hope its not toned down too much, but I have to accept that they cant take too many chances if they really want a successful franchise. Sheesh 'Hollywood' Today. I'm sure we didn't used to get this cop out talk back in the days of Total Recall and Robocop. This diet of Avatar Harry Potter and Twilight has skewed things TOO far in the wrong direction in my opinion, the lame direction.